For the upcoming 4th of July weekend, two lakes in the East Bay Regional Parks will be closed to swimming due to toxic blue-green algae -- Temescal in Oakland and Quarry Lakes in Fremont -- and warnings are in place at Lake Chabot and Shinn Pond. Characterized by pea-green water or mats of algae at the surface, blue-green algae, also called cyanobacteria, "blooms" with warm weather and drought, then "busts," dying and decomposing and sometimes releasing toxins into the water. Several dogs died last year after swimming in Lake Chabot during an algae bloom, likely due to swallowing water or licking their fur after swimming. One of the worst local outbreaks occurred at Pinto Lake near Watsonville in 2012. Fed by agricultural runoff, the cyanobacteria outflow of toxins from Pinto Lake reached Monterey Bay and killed 30 endangered Southern Sea Otters. This catastrophe led to the creation of legislation, Assembly Bill 300 which, if passed by the senate and signed into law by the Governor later this year, would provide training and a centralized database for local water authorities to test and report dangerous algae blooms. It would also create a statewide algae task force that could look into causes and solutions as well as potential funding for dealing with the mounting problem. Cases of toxic algae have been increasing because of our current warming trends, more concentrated phosphates from runoff and lower water levels in lakes and ponds due to our four-year drought. Blame it on global Climate Change, but an increase in average temperatures over the last two centuries has resulted in blue-green algae growing at a much faster rate than other phytoplankton, according to a recent study led by Professor Rolf Vinebrook from the University of Alberta. The Alberta scientists were testing a new method for early detection of freshwater cyanobacteria. By adapting technology used by oceanographers to warn about shellfish poisoning events produced by toxic marine algae, they were more quickly able to catalog blue-green algae samples. 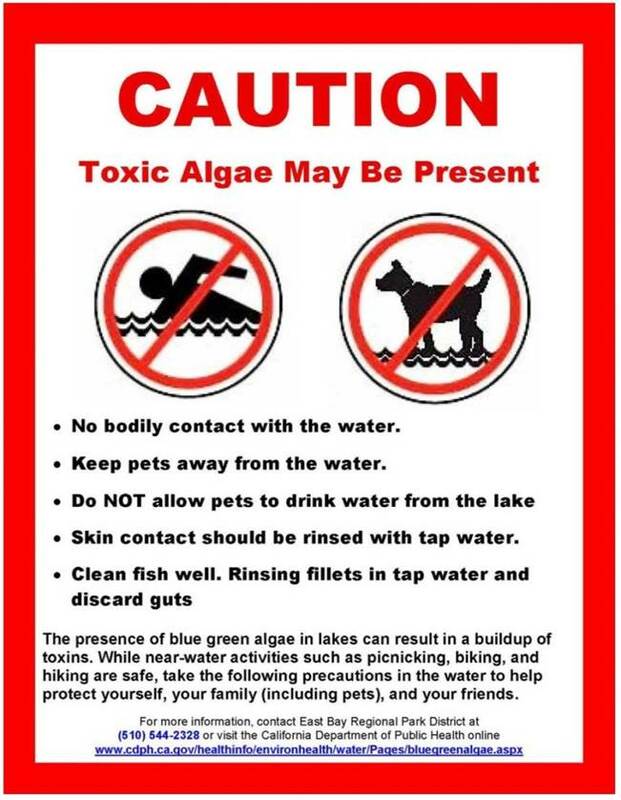 Much remains unknown about freshwater toxic algae blooms but their toxicity to humans, as well as pets and wildlife, is well known. 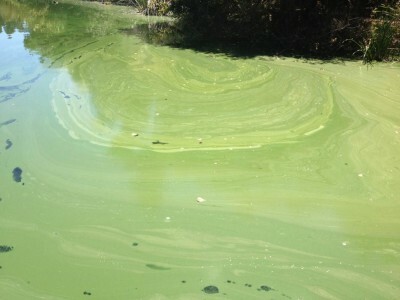 Reactions to contact with water where blue-green algae toxins are present include rashes, skin and eye irritation, allergic reactions, and gastrointestinal upset. Exposure to high levels of the toxins can cause serious illness and death. This summer and fall use caution when visiting your favorite natural swim area, especially with children and pets. You can find more information on the EBRPD website as well as the California Department of Health’s website. Do not swim in, drink, ingest or cook with water suspected of containing blue-green algae. 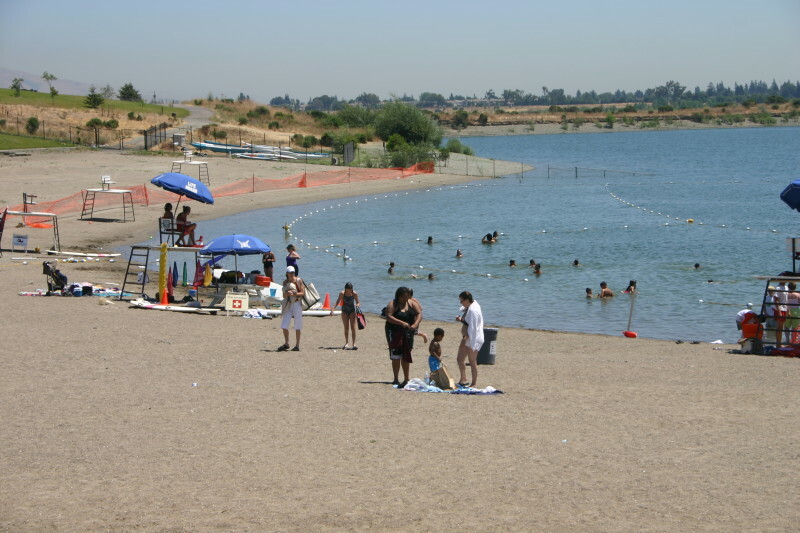 You can still go fishing or boating in EBRPD parks with closed swim areas, unless otherwise posted.